The Arkansas Game and Fish Commission will hold public meet- ings in Waldron, Moun- tain Home and Moun- tain View in the next few weeks to speak about the need for an expansion of the current Chronic Wast- ing Disease Management Zone for deer and elk. Recent test results from CWD-positive deer along the outer edge of the zone boundary have caused the AGFC to consider ex- panding the current CWD Management Zone to in- clude Baxter, Scott and Stone counties. Biologists with the Ar- kansas Game and Fish Commission identified 238 new positive cases of chronic wasting disease in white-tailed deer and three elk during the 2018- 19 deer hunting season. Among these were posi- tive cases on the northern edge of Scott County and the eastern edge of Searcy County. To ensure com- pliance with the AGFC Code of Regulations, any county where a wild or captive cervid tests pos- itive for CWD and any county within a 10-mile buffer of a positive CWD sample will be included in CWD management zone regulations. “As we continue to learn about CWD in Ar- kansas and determine the outer edge of the dis- ease, we have to adjust our management zone’s boundaries in an effort to help contain the disease and slow its spread,” said Cory Gray, chief of the AGFC’s Research, Evalu- ation and Compliance Di- vision. Gray says biologists and other staff at the AGFC want to offer hunt- ers and other conserva- tion-minded individuals the opportunity to learn more about the disease and what steps the AGFC is taking to slow its spread throughout the state. 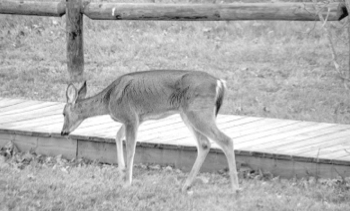 Inclusion within the CWD Management Zone will mean new regulations concerning hunting on public and private land within these counties, movement of harvested deer, and feeding wildlife, which can abnormally concentrate animals into close quarters and increase the likelihood of disease transmission. The following wildlife management areas will be affected by new regu- lations concerning CWD: Cedar Creek WMA, Mud- dy Creek WMA, Norfork Lake WMA and Sylam- ore WMA. Within these WMAs, button bucks will now count toward a hunt- er’s antlerless bag limit and antler size restrictions such as the three-point rule will be removed. These liberalizations are meant to increase the harvest of young bucks, which are the most likely to disperse and possibly carry the disease further. Private land hunters in these counties also will see the lifting of antler restrictions and the change from button bucks being listed as bucks to antler- less. Deer harvest limits also will be liberalized on private land to help low- er concentrations of deer and slow the spread of the disease. The last notable change to wildlife regulations for these counties is the re- striction of feeding wild- life except when used for hunting from Sept.1-Dec. 31. Outside of this win- dow, feeding wildlife will no longer be allowed, with some exceptions (see www.agfc.com/en/hunt- ing/big-game/deer/cwd/ cwd-regulations). “Supplemental feed- ing and baiting of wild- life concentrates animals in close quarters, which increases the frequency of direct contact between animals and increases the chances of disease trans- mission,” Gray said. For Western Arkansas, a meeting is scheduled for March 28 at 6 p.m. in Waldron High School Au- ditorium located at 1560 W 6th Street.